We are alongside the haul-out well at North Sound Marine. The AC is on and we are weathering the after-lunch heat of the day. Best thing to do... nap like Pam... or sit under a fan and blog. We had a beautiful strip loin in the freezer that we were dying to eat. Pam made the rice/noodle concoction and when it was my turn to grill the steak to perfection... we ran out of gas. No self-respecting steak cooker uses a microwave... so we used the waffle iron. Perfect!!! Although Pam was unusually mean and disrespectful as she went through the clean-up procedure. New York Belgian Waffle steak. We were doing non-urgent shutdown chores before we got here but still having fun visiting with friends and enjoying Antigua. Quest (Sid and Cate) hauled last week. 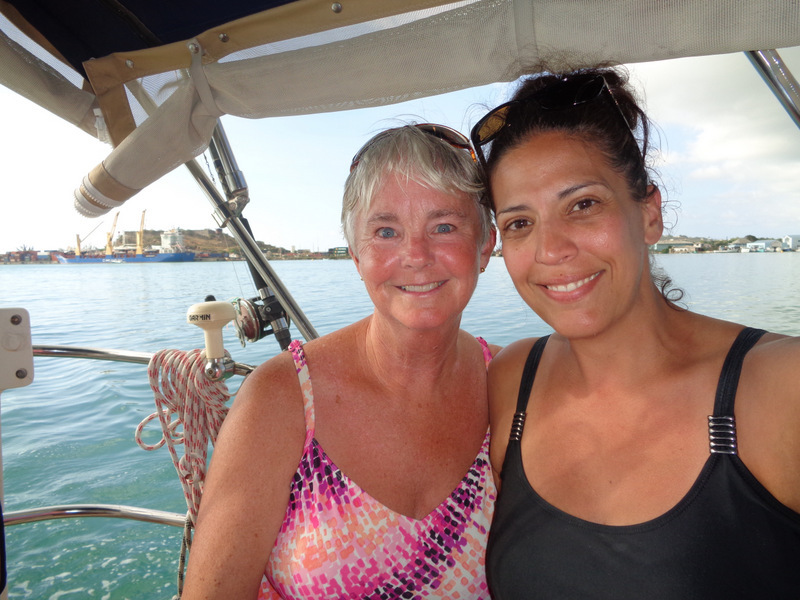 We were able to help a little bit but mostly take advantage of their condo near the Jolly Harbour haul facility. Whoa - staying in here for a while! It's the day before the day before haul-out. Let's celebrate! Quest, Aviva and Blue Pearl enjoying Jolly Harbour condo air conditioning. Harry and Maryke from Holland - hauling soon, too. On Thursday we had an absolutely super day with friends from a cruise ship. It was my great privilege to work with Soraya in my last years in education. While I was there, she was the heart of the school academically and spiritually. She is on leave, and just happened to be in Antigua on our last day before getting ready to haul. Picked them up in the morning and did a little tour from St. Johns down to Jolly Harbour. Then back to Deep Bay for a hike and a much needed "bob" in the bay. There is no wind right now and it is hot as blazes. 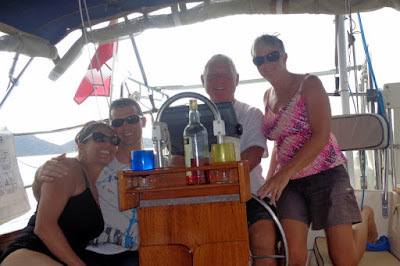 The time flew by - as did the boat drinks and before we knew it... it was time to deposit them back at the boat. After our farewells we headed up to Davis Bay for the evening... arriving right at dusk... but since we know the place well it was not a concern to anchor in the fading light. Over the week end we've attacked the semi-urgent stuff... sails, canvas, liquor management... things like that. All hell breaks loose tomorrow when we haul around noon. In the scorching heat of the afternoon we need to flush the main engine with fresh water, knock a few barnacles off the bottom, clean the prop and all the other things that can't be done while we are in the water. High maintenance - I mean the varnish on the bowsprit. We've heard of boats "sinking on the hard" when rain water finds its way into the boat and can't get out. Ugly mess. To prevent that, we need to create an opening down in the bilge for water to leave the boat in the unlikely event that it somehow floods. Can't do that while we are still in the water. So we will haul, Pam will attack all the remaining tasks and I'll try to keep cool somewhere in the shade. Spending more and more time thinking about our parallel universe back home with kids, grandkids and friends! Woop, woop! More when we are out of here! The weather is warming up here!......so it is a good time to come home! Lots of fun times ahead.Cheers!